Syringodea pulchella Hook.f., Bot. Mag. 99: t. 6072 (1873). 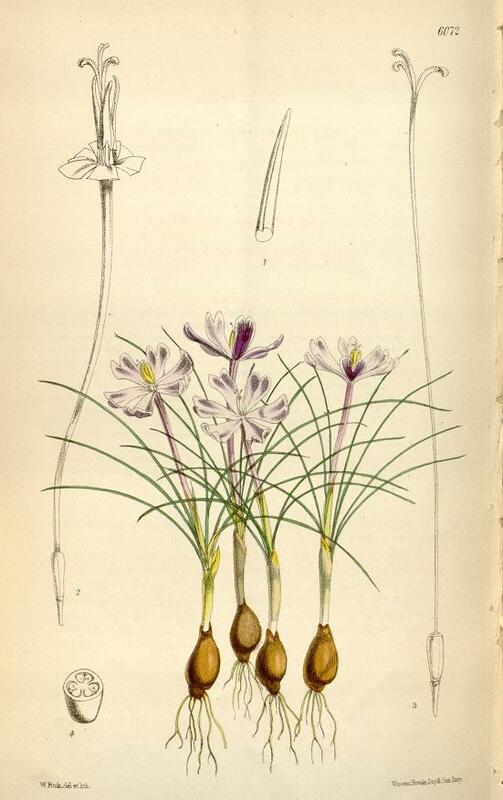 Bot Mag 1873 t.6072 "After much consideration of the ill-defined genera of the allies of Ixia and Trichonema, I find myself compelled to create a new genus of this lovely little plant, which belongs to Klatt's tribe of Ixiea, characterized by the two spathes, separate equal filaments, and linear stigmas. From all the genera of this tribe it differs in the solitary flower and 2-lobed perianth segments. Trichonema is its nearest ally in most points, but has usually a short perianth-tube, or if a long one it is funnel-shaped, its stamens are inserted within the perianth-tube, and the stigmas are divided. Galaxia has a long slender tube, but in it the filaments are connate, and the stigmas are lamellar and multifid. Descr. Bulbs ovoid, the size of a hazel-nut; scales appressed, brown, smooth, not reticulated. Leaves capillary, spreading, green, two to three inches long, terete, with a slight groove in front, enclosed at the base in white membranous sheaths one inch long, with a few ragged brown ones outside. Spathes 2, hyaline, oblong and conduplicate below, subulate-lanceolate above, about one-third the length of the perianth-tube. Flowers solitary, the base of the perianth-tube and ovary immersed in the sheaths, very shortly pedicelled. Perianth salver-shaped; tube two inches long, very slender, terete, not swollen upwards, pale purple; limb one inch in diameter, lobes connate-spathulate, 2-lobed, incurved, dark purple outside, with white edges, lilac within. Stamens 3, inserted at the mouth of the perianth; filaments five, very short, subulate ; anthers yellow linear-subulate from a sagittate base obtuse at the tip. Ovary one quarter inch long, narrowly obovoid, 3-celled; style very long, capillary, exserted, divided at the summit into three revolute linear entire stigmas; ovules numerous, 2-seriate in each cell. Fruit unknown. — /. D. H.